Cook tater tots according to package instructions; set aside. Heat olive oil in a large skillet over medium high heat. Add sausage and cook until browned, about 3-5 minutes, making sure to crumble the sausage as it cooks; drain excess fat, reserving 1 tablespoon in the skillet. Add eggs to the skillet and cook, whisking, until they just begin to set. Gently whisk in half and half; season with salt and pepper, to taste. Continue cooking until thickened and no visible liquid egg remains, about 3-5 minutes; set aside. 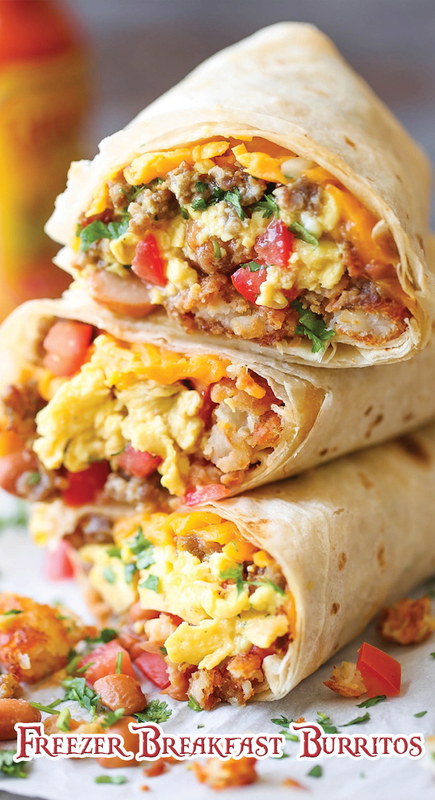 Spread beans down centers of tortillas; top with tater tots, sausage, eggs, cheeses, tomatoes and cilantro. Fold in opposite sides of each tortilla, then roll up, burrito-style. * Place, seam-sides down, onto preparing baking sheet; cover. Place into oven and bake until heated through, about 12-15 minutes.